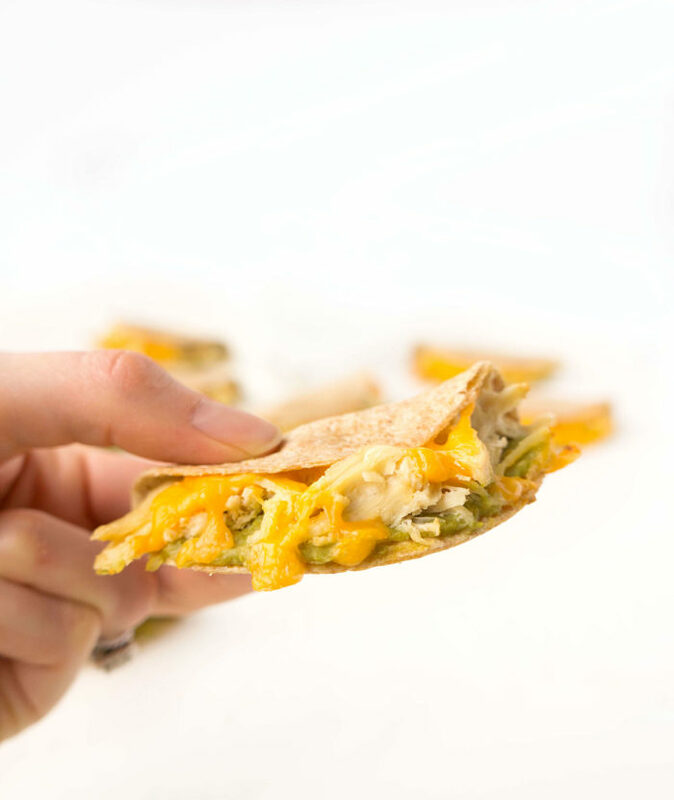 These mini chicken avocado quesadillas are not only super easy to make, they also make the perfect delicious and healthier bite-sized appetizer or snack. Serve along with some salsa for a meal or snack that the whole family will love! Yesterday was an eventful day in our house since my husband’s favourite football team, the Chicago Bears, had a big game. If they won, they would continue on and potentially make it to the Super Bowl. If they lost, they were out. My husband sat on the edge of his seat for pretty much the whole game. It was intense. While he was intensely watching the game, I decided to make these little mini chicken avocado quesadillas that I had been dreaming up in my head. I kinda go into la-la-land when the football game is on. I don’t think I’ll ever understand how the game works. I can follow baseball. I can follow hockey. But football? I’m honestly more interested in the colour of their outfits. Anyways, back to the chicken quesadillas. 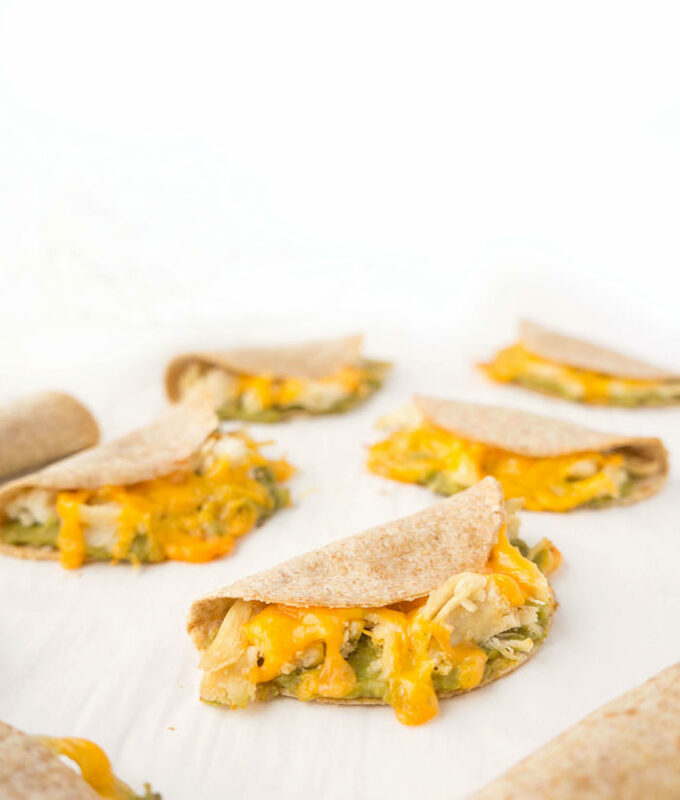 I wanted to make the mini chicken quesadillas for a few reasons. For one, I thought it would be game-day appropriate and the type of recipe my husband would enjoy on a Sunday night of football. Number two, I wanted to test them out on our baby since he’s the best taste tester EVER. I love watching his reaction when he tries different recipes that I prepare. I thought it would be fun to watch him pick up the little quesadilla. Yeah. I’m not that hard to amuse. And number three, I really wanted to get out my circle cookie cutter and make the cute little quesadillas out of the large tortillas. That’s the honest truth. I just love making cute food. A few years ago, I had made these little mini lentil tacos at work for an event that I was running and everyone loved them because they were miniature and made such a cute and delicious appetizer. So I decided to put a little spin on the mini tacos and instead do mini quesadillas. I wanted to keep the recipe simple, because really, who has hours to slave away making time-consuming appetizers and snacks? The first thing you’ll need is a circle cookie cutter. I used a 3.5 inch one and it worked out perfectly. Next, you want to get some large 10-inch whole wheat tortillas and use the cookie cutter to cut circles out of each tortilla. I used about five large tortillas and was able to get about 4-5 smaller circles out of each for a total of 24 smaller circles. You can make more or less depending on how big your crowd is that you’re trying to feed. And don’t let those extra tortilla scraps go to waste! I like to cut them into strips, brush them with a bit of olive oil and spices and bake them in the oven for 5-10 minutes to place on top of Curried Pumpkin Chicken Soup or White Chicken Chili. 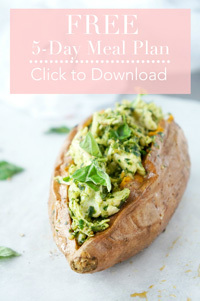 Just a little inspiration for those tortilla scraps! So next, I mashed up a ripe avocado with the juice of half a lime and some garlic powder. You could add a little bit of salt, but personally, I didn’t feel like it needed it, especially if you plan to dip it in salsa once cooked. Place all of the mini tortilla circles flat on a parchment paper-lined baking sheet and spread half of each little circle with the mashed avocado so that it goes right to the edge of the circle. Next, top the mashed avocado with a bit of shredded chicken. I usually like to boil some chicken breasts for about 20-30 minutes and then shred them using two forks. Finally, top the chicken with a little sprinkle of freshly grated cheddar cheese. Fold the top half of the circle over the ingredients on the bottom half and secure with a toothpick to keep it closed while baking. Eventually, the cheese will secure the quesadilla shut, but it needs a few minutes in the oven to get to that point, so that’s where the toothpicks come in handy. 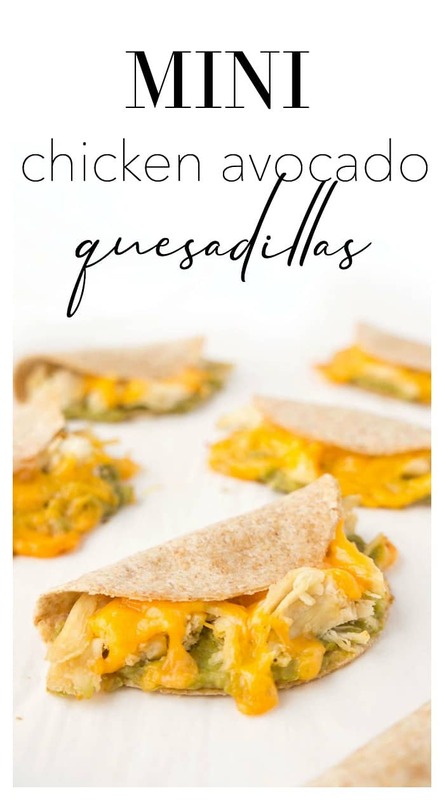 Bake the mini quesadillas in the oven for about 12-15 minutes until the cheese is melted and the outer edges of the tortilla are lightly browned and crispy. And voila! 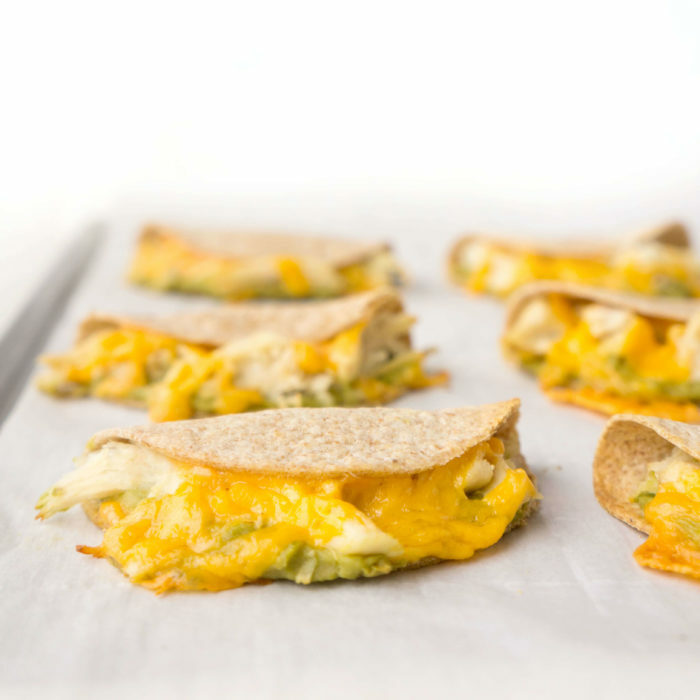 You have incredibly addictive bite-sized little mini chicken avocado quesadillas. Although they taste good on their own, I highly recommend serving them with some salsa. They’re amazing for dipping and it totally kicks the flavour up a notch. 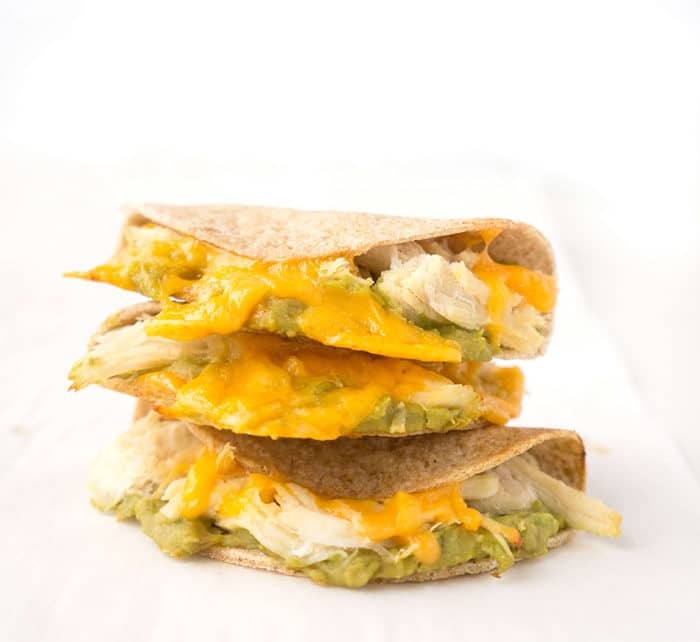 These mini chicken avocado quesadillas are a unique spin on nachos, except this version is packed full of fibre, healthy fats, protein, and calcium, and they’re portion-controlled…provided you don’t eat the whole batch. Although the Bears lost and the game took a turn for the worst at the very end, at least the mini quesadillas turned out. Phew! My husband really enjoyed them, baby loved them and I thought they were pretty tasty too. 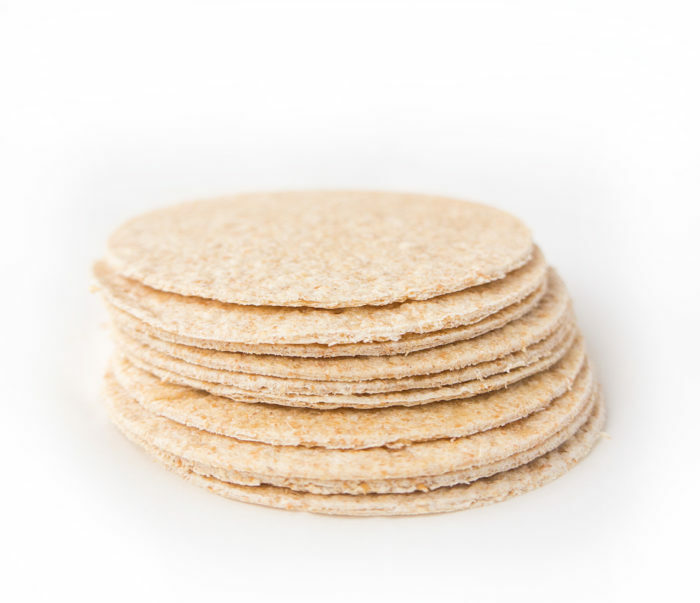 Place large 10-inch tortillas on a flat surface and use the cookie cutter to cut circles out of each tortilla. I used about five large tortillas and was able to get about 4-5 smaller circles out of each for a total of 24 smaller circles. Next, in a small bowl, mash a ripe avocado with the juice of half a lime and the garlic powder until well combined. 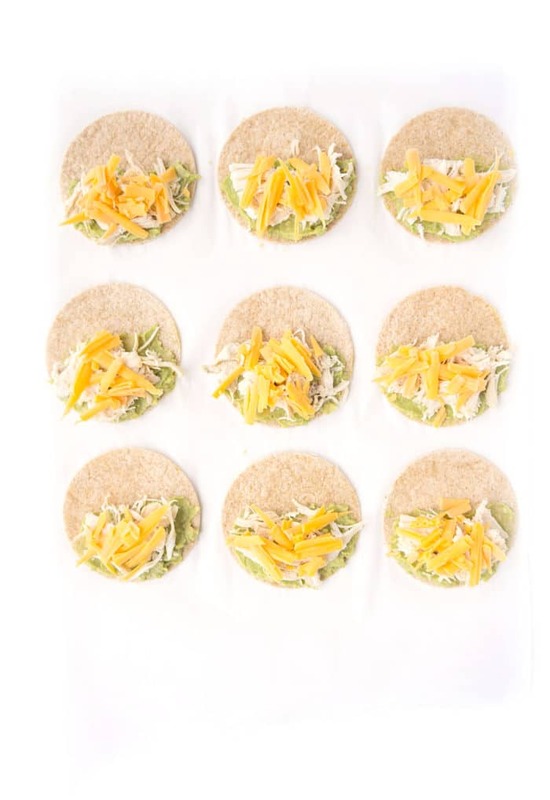 Place all of the mini tortilla circles that you just cut out flat on the parchment paper-lined baking sheet and spread half of each little circle with the mashed avocado so that it goes right to the edge of the circle. Next, top the mashed avocado with a bit of shredded chicken. Finally, top the chicken with a little sprinkle of freshly grated cheddar cheese. Repeat for all of the circles. Fold the top half of the circle over the ingredients on the bottom half and secure with a toothpick to keep it closed while baking. Serve warm along with some salsa.